You are probably aware that the primary downside to filing for bankruptcy protection is that it negatively impacts your credit score. However, how long your bankruptcy remains on your credit report depends on whether you file a Chapter 7 or Chapter 13 case. When you file a Chapter 7, the bankruptcy notation remains on your credit report for ten years from the date your petition was filed. Although this seems like a long time for it to impact your credit score, it is often a minor consequence when compared to the quick, comprehensive relief from your debt that a Chapter 7 case provides. A typical Chapter 7 case lasts four to six months, you can eliminate the majority (if not all) of your debt, and you can start rebuilding your credit sooner. A Chapter 13 case will remain on your credit report for seven years from your bankruptcy filing date. The reason a Chapter 13 remains on your credit report for a shorter amount of time than a Chapter 7 is that a Chapter 13 debtor repays a portion of the debt he or she owes under a repayment plan. Typically, a Chapter 13 filing does not negatively impact your credit score as much as a Chapter 7 case. 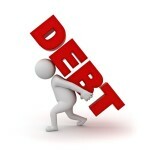 When you are struggling to pay your debt, it is important to understand all of your debt relief options. Let us review your individual financial circumstances and help you understand which type of bankruptcy filing would be most beneficial to you. This entry was posted in Bankruptcy, Chapter 13, Chapter 7 and tagged bankruptcy, Chapter 13, Chapter 7, credit report, score on March 26, 2015 by Michael Faro.